Two members of Airdance Philippines just got accepted to participate in two dance conventions/workshops abroad. Nicole Primero and Jed Amihan have a chance to hone their skills and learn more about choreography and dance while networking with dancers from all over the world and spreading the beauty and artistry of Filipino talent. 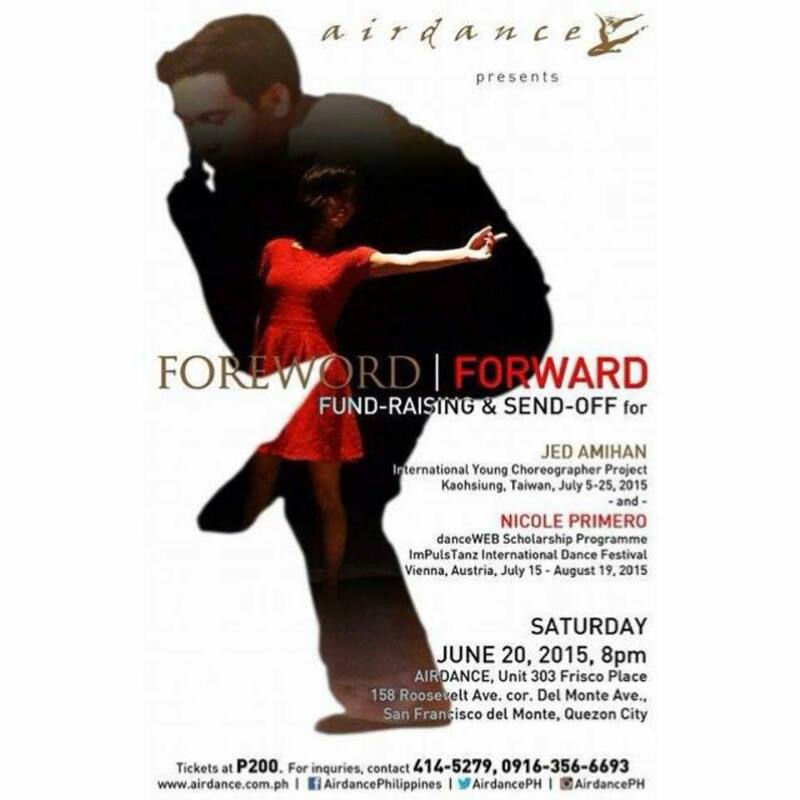 So their company, Airdance Philippines is putting up a fundraiser show Foreword | Forward at their studio in Quezon City to help raise more funds so that they will be able to go. I wrote about them in an article for Juice and here it is to get more of a backgrounder of the two dancers and what they hope to learn and achieve: Foreword | Forward: an Airdance Performance to Support our Artists. You can also check out their indiegogo website to donate money and help them become better at what they do so that they can come back and share what they have with other dancers and the Filipino audiences. Local artists are always getting chosen to attend these workshops and conventions and it really shows how truly creative and talented we are as a people. Unfortunately, we always suffer in terms of financing, because the government really doesn’t do as much as it can/should to support the arts. And artists don’t really make that much money to be able to support these sort of endeavours and I’m just glad that there are now websites like indiegogo that can give people a chance to contribute to the growth of some of these artists and their dreams.